Antique Seal Presses also known as Vintage Embossing Seals are interesting relics of a bygone era. Their production was an art form performed by entrepreneurs called die sinkers working in conjunction with local foundries. Die sinkers took great pride in their fancy figural seal presses which were all manufactured in the USA and Europe. Seal Presses are a great piece of Americana and represent parts of our past both by the body style of the seal and the embossed impression it makes. Seal presses have a wonderful historical interest and should be preserved as part of our collective heritage. Recycling to be used for scrap iron is the main reason why the fancy figural and unusual seals are so scarce today. as well as an informational website called Seal Press Information. Both of these are displayed in their entirety on our website. Antiquesealpress.com has transformed and morphed itself to become the Worldwide Resource for “anything and everything” to do with Antique Embossers. Our company has created a platform to buy and sell antique seal presses. We also are able to change the embossing seal die plates on most seal presses, replacing the dies with current text and images. These new plates then make great impressions each and every time. These retooled and repaired seal presses make great gifts or can be used again by agencies and organizations. 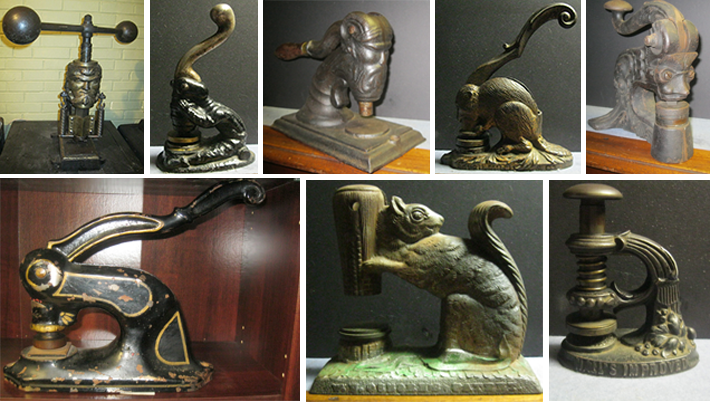 Antique Seal Presses make excellent gifts, desk accessories and are also collectables. 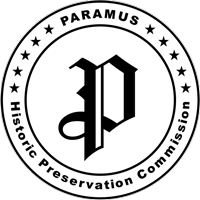 If you have an interest in purchasing a seal press, you can buy one either as an office antique or also have the press retooled, refurbished for functional use today with a customized image of your choice. One may come to possess a seal press completely by accident. They can be found in the basement of a defunct business, an estate sale, garage sale, yard sale or may have just been hanging around somewhere for the last 50 years. If you do come across seal press that you would be interested in selling please let us know. Whether an individual seal or a large quantity, allow us to give you an unbiased appraisal and assist with the sale. We are one of the few companies nationwide, able to recondition these antique seals with new dies which allow them to become fully operational using customizable personal information or corporate logo. In essence, we bring these items back to life so that they maintain their antique flavor as well as become functional mechanisms for modern day use. We can re tool dies on seals from most types of seal presses. Many companies, organizations, or government agencies may have old seal presses that are used on a regular basis. Due to wear and tear and the test of time, these presses may become difficult to operate and very hard to make an impression. We will give you a credit for your old press and offer a modern electric motorized seal. 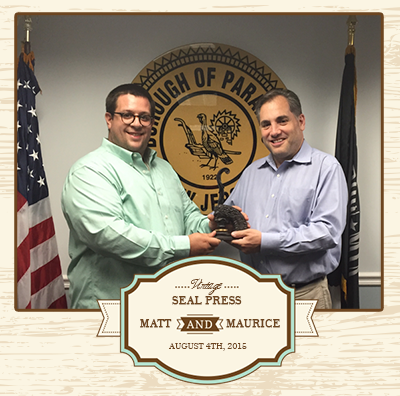 Maurice of Antique Seal Press and Matt of Paramus NJ Historic Preservation Committee taking a photo with a refurbished customized Vintage Seal Press manufactured for organization on August 4, 2015. This website is a resource for collectors as well as purchasers of seal presses. Information on all types of embossing seals including styles, shapes, manufacturers and rarity can be found on this site.